Kitchen design may be approached from many different perspectives. The top priority of one woman I know who was having her kitchen remodeled was the addition of a big window over the kitchen sink. I appreciate her viewpoint. A kitchen window giving out onto a scene that is easy on the eyes is a valuable kitchen feature in my opinion. I would rank my kitchen window higher in importance than the replacement of any of my very ordinary appliances with fancier versions. I would not trade my window for more counter space or spiffy cabinetry. Years later, Margarete Schütte-Lihotzky described her view of her creation in these terms, “Before I conceived the Frankfurt Kitchen in 1926, I never cooked myself. At home in Vienna my mother cooked, in Frankfurt I went to the Wirthaus [restaurant/pub]. I designed the kitchen as an architect, not as a housewife “. It is a telling remark. Despite The Frankfurt Kitchen’s cool reception, our modern kitchens have profited from the design ideas first realized in it by Margarete Schütte-Lihotzky. And happily, in so doing, there was no need to relinquish the kitchen window…or whatever part of your kitchen that is dear to your heart. 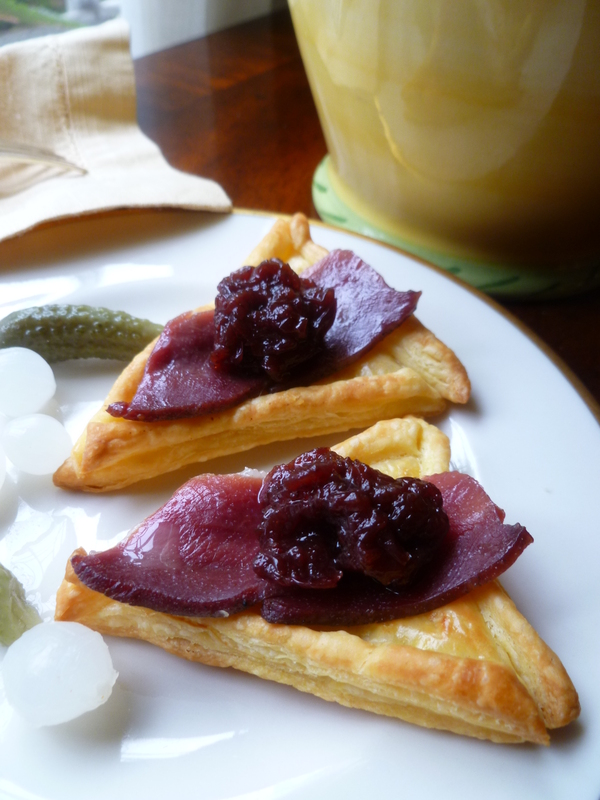 Smoked Duck with Preisselberry Sauce is an hors d’oeuvre recipe and it is a brief one, respectfully acknowledging Margarete Schütte-Lihotzky’s emphasis on the good use of time and the need we all feel to use it well. The diplomatickitchen hopes the recipe will add to your enjoyment, both of the time you spend in your kitchen and, later, around the table with friends. 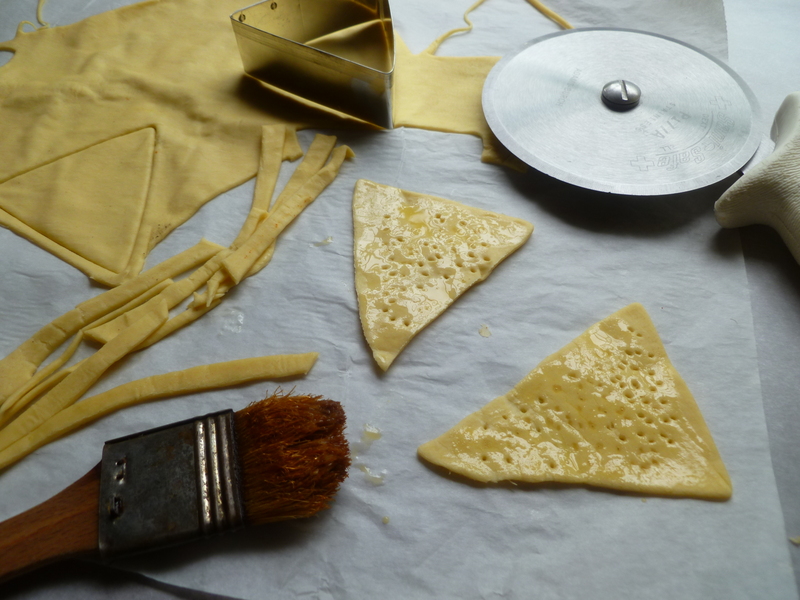 A Timing Note: The puff pastry triangles may be made several hours in advance. The Preisselberry Sauce may be made several days in advance, refrigerated, and brought to room temperature to use in this recipe. 18 slices of Smoked Duck Breast: Smoked Duck Breast comes in packages, pre-sliced. There are 18 slices in the 90-gram pack shown in the photo, which is a variety smoked with black pepper. Smoked Duck Breast also comes in whole, unsliced form that you may slice yourself. The pictured duck breast is ‘magret’. 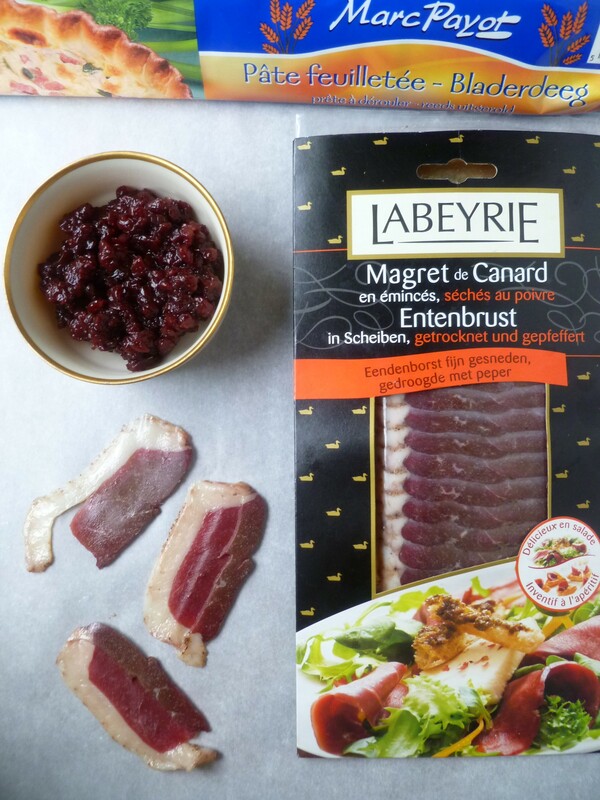 The magret is a very lean filet of duck (or goose) and is the same used to make confit or foie gras. 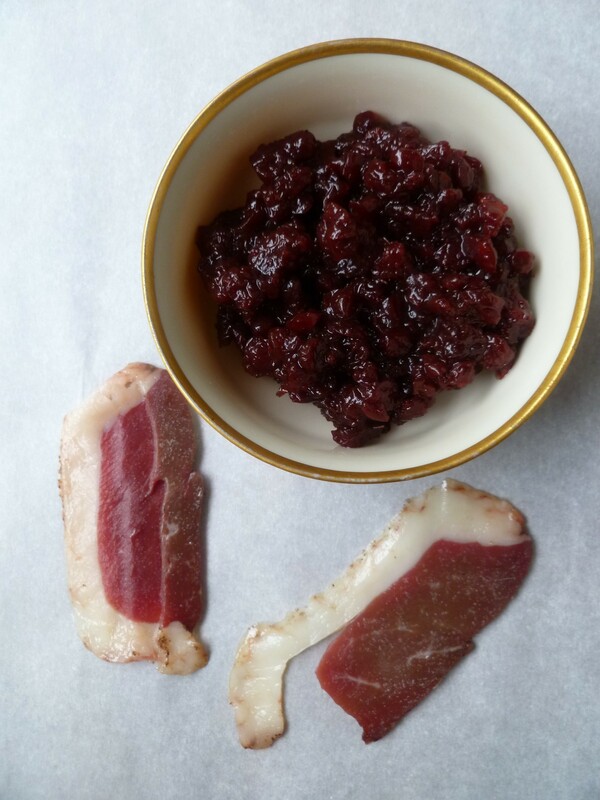 Any smoked duck breast will be fine for this recipe. 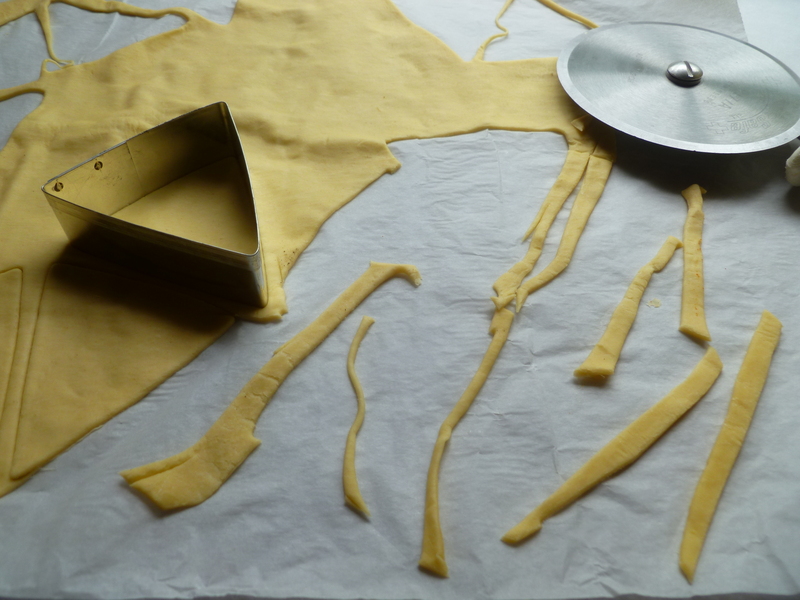 a round or rectangle of packaged Puff Pastry (230 g): Rectangles tend to be thicker and should be rolled out a bit thinner before cutting. 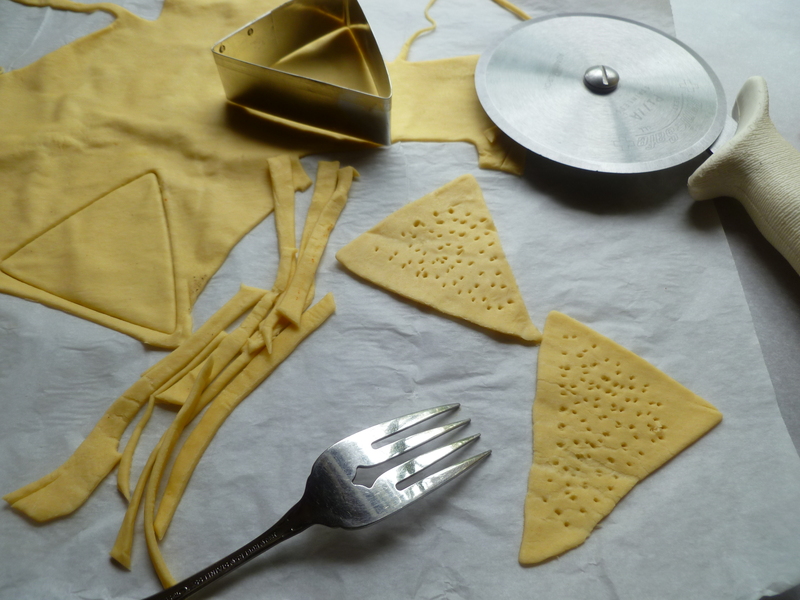 There will be some leftover pastry which may be wrapped and frozen to use for something else. Preiselberry Sauce: The recipe is below in Part II. Cornichons and Small Cocktail Onions are suggested accompaniments. 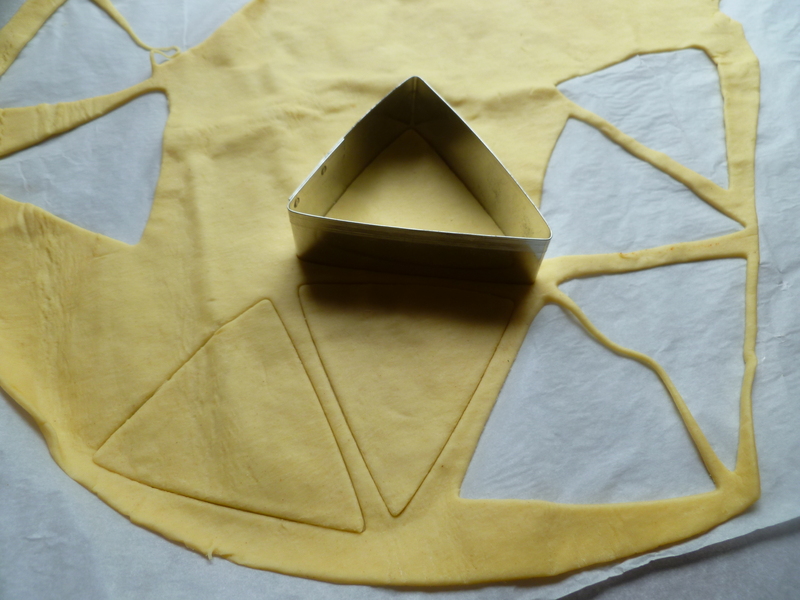 a Triangular-shaped Cutter or a Triangle Shape cut from heavy Cardboard to serve as a pattern: The Cutter in the photos has 3-inch sides. 2. 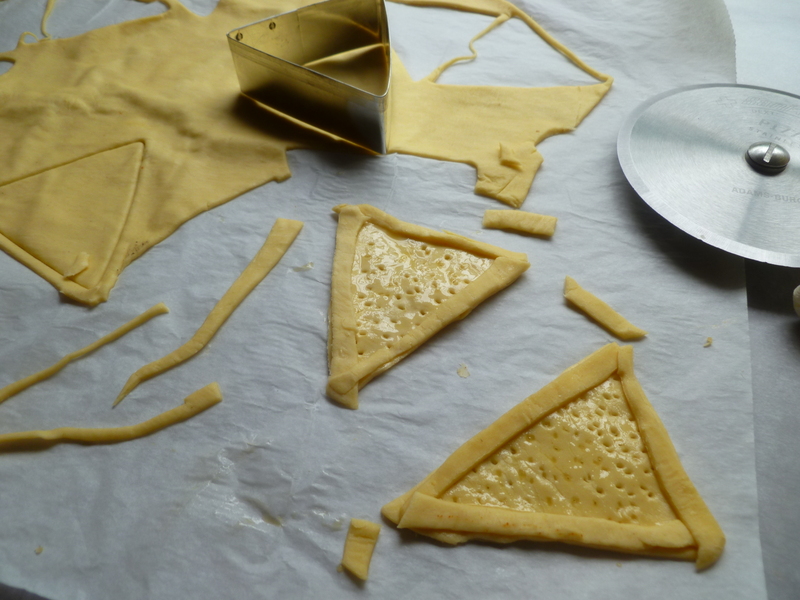 Cut out 18 triangles from a sheet of puff pastry, using a triangle-shaped cutter or a triangle cut from heavy cardboard as a guide. 6. Bake the pastry triangles at 400 F. for 6 minutes, slide them out of the oven and prick the centers of the triangles again with a fork, and bake them for 4 more minutes. Transfer them to cool on a rack. 7. Just before serving, assemble the hors d’oeuvres. Remove the fat from the slices of duck, or, if you prefer the duck with the fat, leave it on. 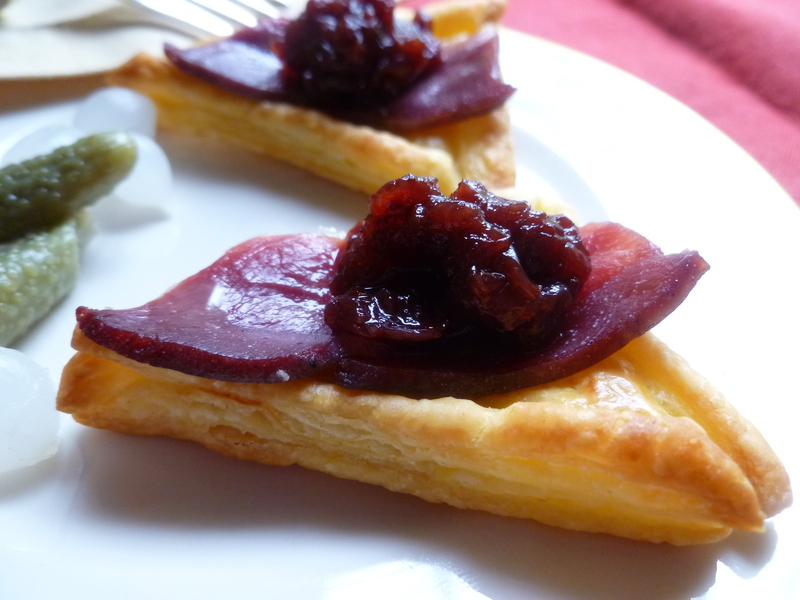 Place a slice of duck on each pastry triangle and top the duck with a small amount of the preisselberry sauce. Cornichons and small cocktail onions are a good accompaniment. Part II: Preisselberry Sauce Redux: This recipe, with step illustrations, appears here in this previous diplomatickitchen post. A Timing Note: Preiselberry Sauce may be made several days in advance, cooled, covered and stored in the refrigerator. Bring the sauce to room temperature to use in this recipe. 1. Drain the preisselberries, reserving the liquid to add a bit to the finished sauce to adjust thickness and flavour if necessary. 2. Put the berries, sugar, lemon and orange peels and the cinnamon stick in the pot. Do not add any water. Stir everything together. The sugar will begin to dissolve and create a juice with the berries. Simmer the mixture over low heat. In about 20 minutes, the juice will become a syrup and the berry mixture will be reduced to a thick sauce. A wooden spoon will cut a clear path through the sauce and the syrup will only gradually creep out into it. 3. Taste the sauce. If the sauce has thickened more than you like or to sweeten it more according to your taste, add a little of the reserved syrup from the drained berries. Remove the cinnamon stick, and the orange and lemon peels. 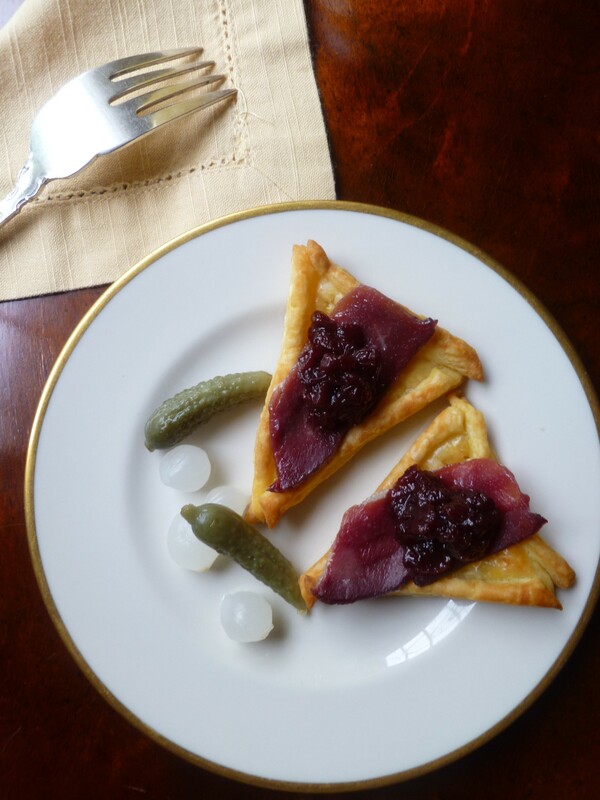 A Note: Smoked Duck with Preisselberry Sauce is served with Cornichons and Cocktail Onions as the Hors d’Oeuvre in the Dinner Menu: Dinner at Journey’s End. Oh, the Frankfurt kitchen ! I remember it from a museum in Vienna. To think that quite a few of the best designed kitchens with most gadgets are just for display. I also love my window over the sink looking into the garden. A luxury I don’t have in Milano, but above sink we have a cabinet with “hidden” dish drying rack – very handy, as dishes drain onto a tray above sink, and your hand washed dishes are out of sight. And what a luxury to be able to have smoked duck at your reach ! I have to investigate if itis available in Milan – can you find it in your neck of the woods ? It looks and sound so very delicious paired with Preisselberren and puff pastry – you are the queen of elegant and delicious presentation ! Well that drying rack sounds pretty handy-dandy. I think the Victoria Albert also has a Frankfurt Kitchen. I read somewhere that most of them were thrown away in (I believe) the sixties to be replaced with something more modern.